On International Holocaust Remembrance Day: Morro Rock, the "Gibraltar of the Pacific", is an extinct volcanic peak rising 576 feet above the ocean. First charted by Juan Cabrillo in 1542, it is now a protected home for the endangered peregrine falcon. Many, many years ago, Abq Jew and his parents, Richard and Roselyn Yellin, of blessed memory, spent a wonderful, long weekend at Morro Bay. 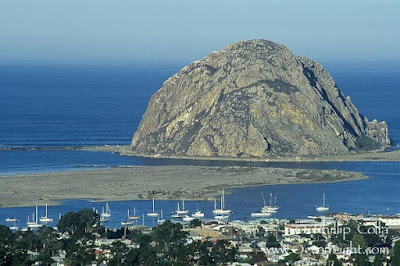 We rented a cabin that looked out over the bay, and Abq Jew recalls spending a lot of time just gazing at Morro Rock. Abq Jew hadn't thought about Morro Bay for a long time - until Jeff Wheelwright, author of The Wandering Gene and the Indian Princess, mentioned (when he spoke and signed books at Bookworks) that he lives there. Many years ago, Abq Jew and his wife and his parents drove down from Sunnyvale to Morro Bay, to have dinner at the half-way point with our dear friends, Mike and Jean Schuster of Los Angeles, of blessed memory, whose twin daughters Laurel and Carol - talented musicians who would be about Abq Jew's age - are also, alas, of blessed memory. Mike and Jean were about the most wonderful people Abq Jew has known. Both Laurel and Carol predeceased them. Laurel was lucky enough to marry and have a child, a son (now a musician in Victoria, BC). Carol was fortunate to find a partner; but no children. Who will remember the wonderful Schuster family once Abq Jew is himself of blessed memory? 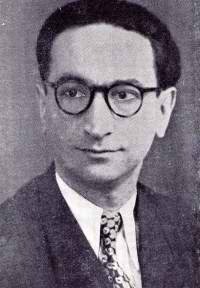 Binim Heller asked himself the same question - only it was about his sister Khaye, who was among the many, many murdered in the Holocaust. His answer was a poem, "Mayn Shvester Khaye." Israeli singer Chava Alberstein was born (1947) in Szczecin, Poland. Her family moved to Israel when she was only four years old, and she grew up hearing Yiddish. She knew fellow Pole Binem Heller (1906-1998) personally. Ms Alberstein set "Mayn Shvester Khaye" to music. 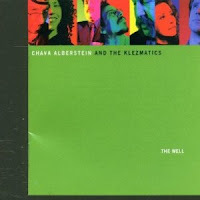 In 1998, she recorded it, with the Klezmatics, in the album "The Well." The words (see below) of Binim Heller's poem alone are enough to bring Abq Jew to tears. When combined with Chava Alberstein's melody - the song breaks Abq Jew's heart every time he hears it. Who will remember? In the house on Smotshe Street with tumble down steps. When there was hardly light in the sky. A wretched penny's worth of change. She fed them and watched over them. At nightfall, when little kids get tired. She wasn't even ten years old. My sister Khaye with the black braids. Was burnt by a German in Treblinka. The very last one who ever knew her. In these terrible days of our times. In heaven she sits at his right hand. The Morrow Bay is truly one of the most beautiful places on the planet. The place is similar to Santa Fe because of it's beauty, great food, tons of places to stay, both high end and affordable, plus it's a bit spiritual as well for many people. Your comments about Morrow Bay and your time there are wonderful.